Well, 2017 was abit of nightmare at times eh? Just over half way through the year, my illness blind sided me and I was totally unprepared. I’d forgotten about my Crohn’s Disease because I was busy. Which is a terrible excuse but a god’s honest truth. And when I say that out loud, it sounds terrible because who forgets their illness when they get busy. It’s probably because I was busy and I was just.. enjoying life. Like I had planned on. 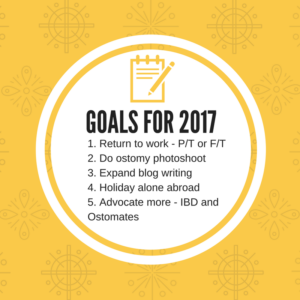 I was so proud when I started reflecting a couple of weeks ago, that my goals for 2017 were pretty much completed except number four. This year I have been extremely busy; finding a new job, a new career within that has been a massive highlight and took months to feel normal, for me to readjust to my new lifestyle. I knew that it would be tough but it’s been a great achievement. To continue writing whilst that process was going on, whilst relocating, whilst training and as my health deteriorated; that has been icing on top of the cake. But with that, also came bad news: my Crohn’s was back only 8 months after surgery, I would need medication again and it was going to be risky. Despite all that, I sit here in December; employed, writing and feeling incredibly lucky. So, what have been the highlights of 2017? Continuing to deal with my acceptance of IBD. Narrowly avoiding another surgery in August due to a new & ugly IBD flare. Falling in love with my niece. Finding myself in a new job after relocating in April. Supporting Colostomy UK and Bowel Disease Research Foundation in their campaigns. Learning and navigating a new hospital and NHS Trust. Seeking help for my mental health. Teaching my colleagues about the adventures of living with a chronic illness. Vedolizumab made a return and boy was I grateful! Welcoming some much needed self love and confidence. I complied this and despite how gloomy I’ve been about my health, 2017 has been a good one. I’ve learnt a hell of a lot about not only my health but myself. I’ve advocated harder for my own care as a patient, I’ve become more informed and I’ve toughened myself up to do what is necessary. I’ve found a job in which I love what I do and I am proud of my experiences. All the while, finding the courage to relocate, hold down my relationship and have time for my family. It’s been alot to cope with and I can safely say, despite my fears throughout the summer, I’ve come out stronger. This year I’ve been able to actually see what my life can be like when I am healthy. It also has shown me how much I can take when things get terrible too. This summer tested me to my limits. I’ve not had to experience being sick whilst working since just prior to my diagnosis six year ago. I’ve not had to make big and scare decisions about my care, about taking great leaps of faith like I did this year. I had to trust in others, when I needed help. And they came through for me, which continues to astound me every day. I’ve become a prouder and more confident IBD patient and ostomate throughout these last six months, especially. I feel like I’ve grown up abit more in this year than I have done in a long while. I guess most of this is down to feeling well enough to experience ‘normal’ life, like everyone else does. The mundane in routine has gotten me dizzy; I’ve never been able to hold down a job as long as I have done so far! I’ve never been so accepted and respected as I am within the company I work for! I truly appreciate my job, it has saved me. My relationship this year has been tested. Both of us took on new job roles, within new companies and this has pushed us geographically further apart. But, its brought us together like never before. Distance does make the heart grow fonder. The same can be said for family life too; we’ve celebrated my highs and we have mourned my lows. We have all stuck together and my appreciation for them grows deeper every single day. They took me in when I was sick – again – and held me up I needed to stand up and shout. This year has had some high and proud moments but it has also had the lows of chronic illness. It’s surprise has been how many people have been in my corner for me. So, what have I learnt living with a chronic illness in 2017? Don’t take good days for granted. Your mental health is just as important as physical health. You are entitled to adequate pain relief and should never been seen as drug seeking. It takes skill to change your ostomy bag whilst recovering from sedation! Embrace the bad. It’ll pass, it always does. Don’t be afraid to ask for a referral for side effects. IBD nurses; boy they are amazing. Appreciate them, if you have one. If you don’t, fight to get one. When making a big decision; take three deep breaths, clear your head and think. Be proud of your quirks and personality. Only you can be you. IBD is different for everyone, everyone reacts differently. Find a doctor who understands this. Say thank you and mean it when you do. It is okay to be sad and negative, but if this goes deeper, please seek help. Depression is real with IBD. This year has thrown me about, I wasn’t expected anything that 2017 has given me but I have embraced it, all of the good and the bad. The bad has made the good feel so much better, because my appreciation is strong. Without the bad times, without the worry and without the heartache; I wouldn’t know how good the joy and pride would feel. The life of being chronically ill continues; along side the fight for raising IBD awareness, ostomy education and ending poo as taboo. Come on 2018, I am ready for you!